Bravo Sahib! The Sahara dry comedic subtleties of your last sentence induced a paroxysm of giggles in me that would have been unseemly for a 10 year old girl! Brilliant! Thank you dear Crew! Conversations with Sahib Jr. often evoke these insights. Crew, you have scooped me again!! 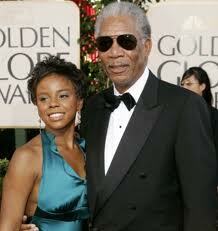 How did I miss Morgan Freeman story and yes, ewwww, is appropriate. He must have dumped his long time mistress when the cradle robbing opportunity presented itself. Stay classy Morgan.